If you’ve driven in downtown Tacoma down Pacific Avenue, odds are you’ve seen Jooley Heaps and her bright red hair outside her vintage clothing store, Box Top Vintage. It’s a strange and wonderful store. This week, Jooley was nice enough to participate in ‘5 Question Friday’. 1. What is Box Top Vintage? 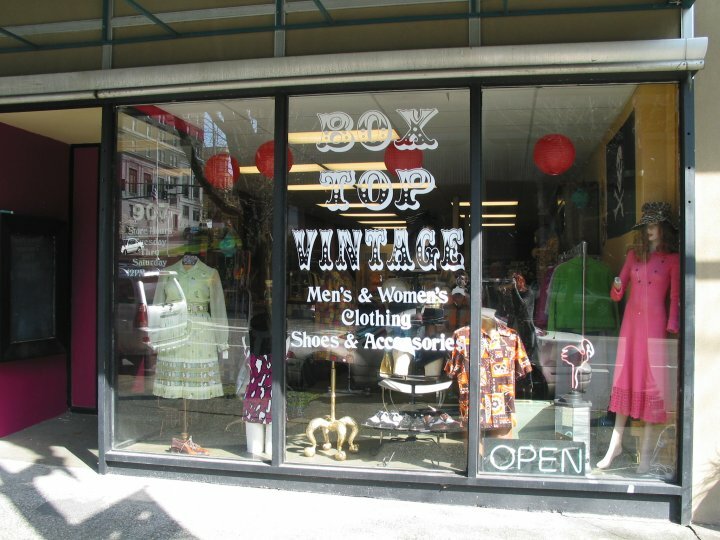 Box Top Vintage is a funky mix of vintage and retro clothing as well as retail items,novelties, and clothing that ya can’t find any where else. It rules! 2. Why did you locate your shop in Tacoma? My first shop Lady J’s Vintage clothing was on 6th ave back in 2003/2004…I was given this opportunity to open a shop, I jumped through necessary hoops to get the store and open it..I’ve been open one year. 3. What is the strangest thing in your shop? Strangest item, well that is a hard one…I have a lot of “Homies” plastic figures and plush… I also have an Oh No! Zombies board game, mustache bandages, as well as “Just like Dad” candy cigarettes, and a zombie brain gelatin mold. So I dunno. I have a lot of oddities haha. 4. What is something you’d never carry in your shop? I would never carry items relating to drugs. Or dildos. 5. Your shop is one of the most interesting ones I’ve ever been in. How do you find the unique items that make Box Top so interesting? I always search the net for cool retail items, and if they have a low minimum order then i basically apply for a wholesale account. Woo hoo! Oh and even if the vintage clothing is beyond gross I still totally carry it. Someone always has a wierd party to go to and they want something rediculous. And for that, I always have their back. !